Fuel contamination is more common than you think. Most of the gasoline available today in the United States is clean and free of contaminants. But, there is still contaminated gasoline being sold around the country, from Decatur to Florida to New Jersey. Dirty storage tanks: Loose storage tank caps can allow dirt and water into the tank when it rains. Sometimes storage tanks rust out. This can allow water into the tank, and rusty sediment can build up in the tank. (These problems are in addition to the obvious environmental concerns caused by fuel leaking out of rusty tanks). 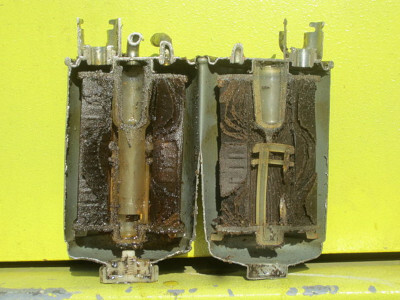 Fuel pumps have filters, but they don’t catch all the debris or water. So drivers can pump contaminated gas into their cars. Stale fuel: Gasoline can go stale in 30 to 60 days, especially if stored in a non-airtight container. The process of oxidization destabilizes the fuel, and causes gummy deposits to form in the tank. These deposits can clog fuel injectors and carburetor jets. Clogged fuel filter: The filter’s job is to filter dirt and other contaminants out of the gasoline before it goes to the engine. Contaminated fuel will clog up the filter quickly. Damaged fuel pump: Water in the fuel can easily corrode fuel pump components, causing the pump to fail. Poor engine performance: Sometimes the engine will not get enough fuel due to a clogged fuel filter. Some contaminants will make their way to the engine and clog up the fuel injectors. This can cause symptoms such as slow acceleration, rough idle, poor mileage and more. Water in the fuel causes similar symptoms. If one of your customers brings in a car with these symptoms, don’t be so quick to rule out dirty fuel. It takes only a few minutes to check the fuel. Use a swab test to determine if the fuel is stale, and if it has water in it. Ethanol masks the smell of stale fuel, so smelling the fuel is no longer a reliable test. Check the fuel filter for sediment. Use an additive to treat the gas. Additives will bond to the water, allowing it to go through the combustion process. This will work for smaller amounts of water in the tank. Drop and drain the tank. If you find sediment in the fuel filter, you could drop, drain and clean the tank. Or you could replace it completely. Of course, if you drop the tank, inspect the fuel pump and replace it if needed.